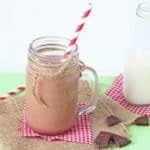 A healthy and fun way to make chocolate milk! Add all the ingredients to a saucepan and heat gently until everything has combined, stirring regularly. Allow the chocolate milk to cool slightly before pouring it into an ice cube tray. Freeze for at least 4 hours or until all the cubes have frozen through.